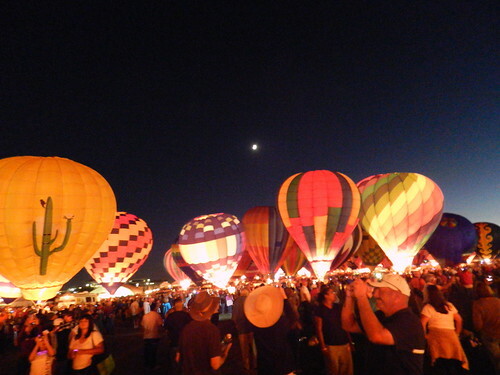 Mali Mish – Day 4: Albuquerque Balloon Fiesta and Twilight Twinkle Glow. 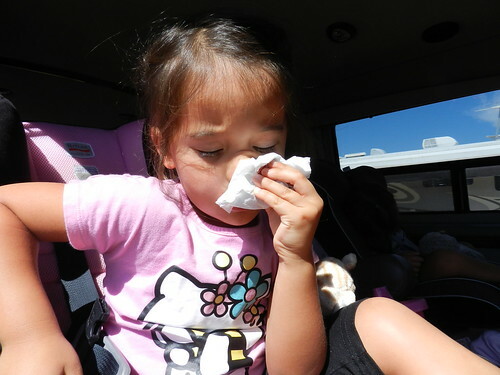 The dry high desert climate finally got to one of us with Ava getting a bloody nose the moment we opened the door at the campground. That and she was elbow deep picking a winner surely didn’t help. 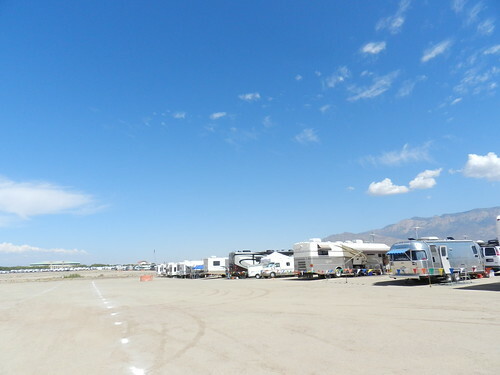 The RVs attending the Balloon Fiesta are welcome to dry camp at the empty field across from the festivities for $30 a night. There are partial hookup sites as well as full hookup sites for more money but we chose to rough it with the general population. 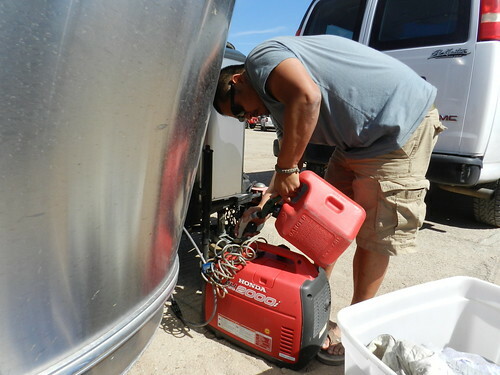 We bring our generator with us on all of our trips for times just like this. We have actually not used it much and these three days will really give us an idea of what it is made of. I’d imagine this is as close as I will get to Burning Man. Every 20 minutes or so, school buses circle around the campground picking up wandering RVers looking for hot air balloons so once we finally settled in, we found and hopped on one to see what this event is really all about. 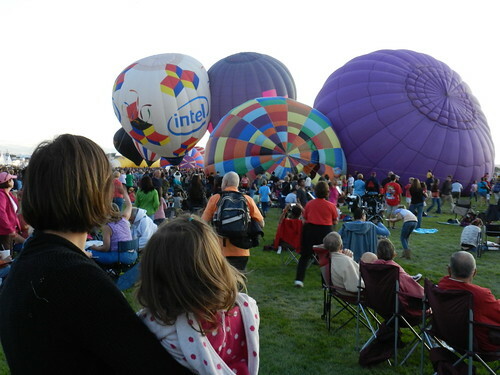 The event is held at Balloon Fiesta Park in Albuquerque which happens to be the hot air balloon mecca of the world. 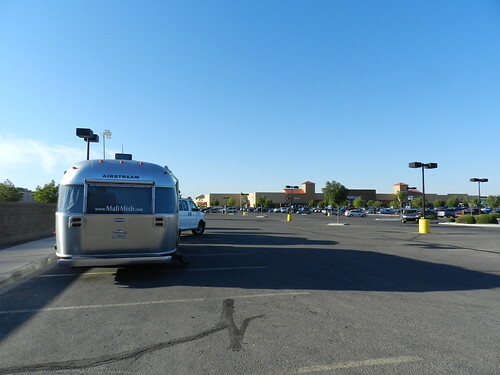 It is miles long and multiple football fields wide and more Indian Fry Bread booths than you can imagine. 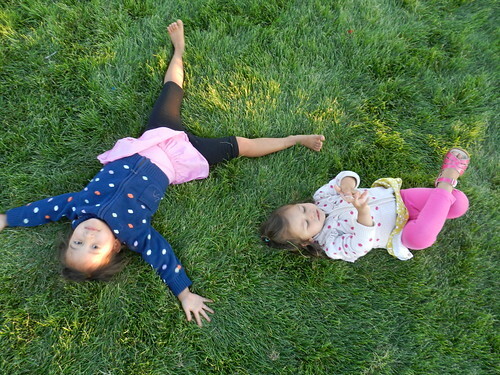 This is what the girls decided to do after shaved ice and junk food: Making Grass Angels. 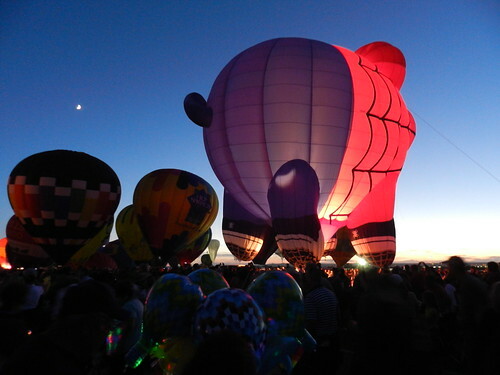 Each night at the event the balloonists all gather at the field for a little thing they call ‘Twilight Twinkle Glow’. It is one of the most magical things we have ever seen. It is hard to say whether or not seeing these huge balloons rise up into the sky will be more spectacular than to see them glow with each flame thrust at night. Another thing we didn’t realize either is how up close and personal the entire process is with the balloons. There are no requirements for us to stay a certain distance away from each balloon. 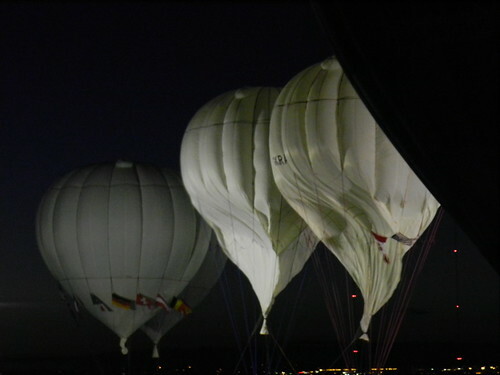 In fact, many people volunteer to help with the balloonists as they prepare for their ascensions. As the sunsets over the horizon, we start to get an idea of what an amazing sight this is going to be. 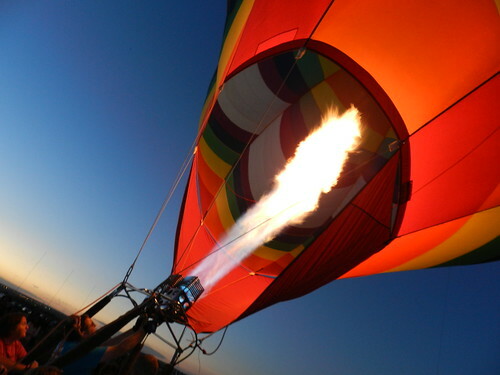 All around us, balloons are being inflated with each thrust of the burners. On the edge of the park, these are gas balloons readying themselves for a long distance race. Most of these balloons have several thousands of miles ahead of them in the coming week. 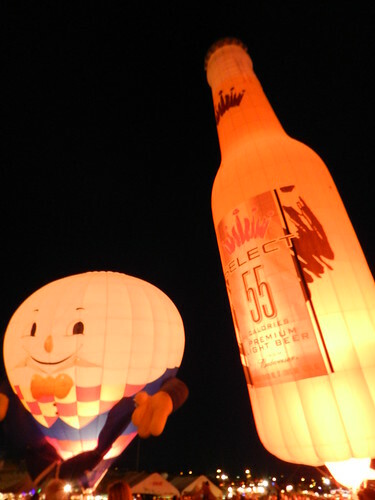 Back at the main attraction, Humpty Dumpty is enjoying himself a Bud Select 55. Someone must have made a comment about his weight problem that got him self conscious. Unfortunately, no one said anything to Spider Man. He has really let himself go since last time we saw him. Hopefully this photo gives you an idea of just how amazing this event was. There is an announcer that helped to coordinate the balloonists in synchronizing the lighting of the burners so we can get shots like this. To get an even better idea of what it was like to be here, check out this little video clip we took. 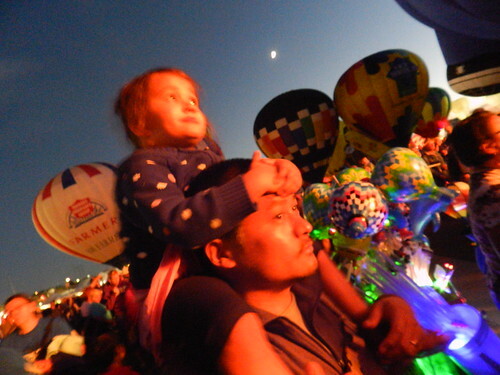 One Response to Day 4: Albuquerque Balloon Fiesta and Twilight Twinkle Glow. so jealous! 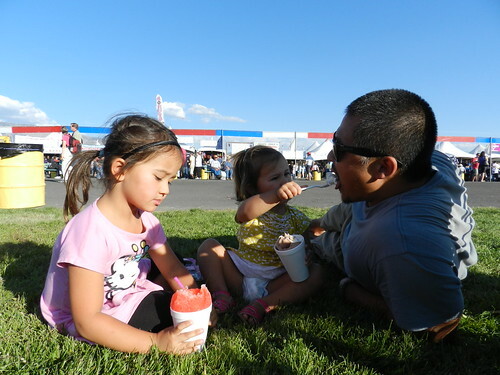 we had planned for over a year to be at the balloon fiesta but life had other plans for us, love seeing your photos! !